Thank you for teaching golf and help me to be a winner on my first competition. My father is very happy with my game performance. Special thanks for your attention and dedication on my son golf training lessons. 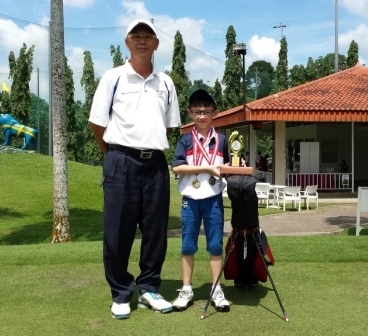 Syabil won the Interschool League golf tournament. He likes to continue his golf learning and training with you. A short note to thank you for teaching my school golf CCA. I have been over 30 years of teaching with MOE, in charge of many sports and work with sport coaches during my teaching career. You are the only coach that I have high regard and respect for your teaching methodology. You have an improvised 'system' of teaching student golf and most importantly able to perform many roles as a educator throughout the year of the school golf programme. I like your passive, assertive and reflective approach toward each of the student during the golf lessons. You have shown me that you have acquired vast knowledge and skills in areas of: pedagogy; student learning behaviors; and ability to perform differential teaching to meet each learner's learning style. Thank you very much for imparting your profound golf swing skills to me. It certainly did help to improve my game tremendously. Now I can drive my tee-shot constantly to 220 meters without fading, my short games is much more accurate than before I met you and needless to say my chipping shots performance too. I'm very glad to have chosen and recommended your golf swing technique learning classes to my clients, because they too have benefitted from your lessons. Your golf swing physical dynamic drill training and technique are one-of-it's kind and definitely work wonders. Thank you once again. I will definitely recommend more clients for your golf swing technique learning and improvement classes in the near future. Looking forward to your book too. I enjoy playing better golf today. After learning from your one-on-one Intermediate Golfer Swing Training Program I had cut 15 strokes from my score. Your golf short games technique are very valuable to me now. Now I can pitch and chip the ball on uneven ground conditions to near the hole with more success and confidence. Thanks for sharing with me your rich golf swing knowledge. I am so happy with my golf swing and game from the day I took up your golf learning and training program. Started with zero Golf knowledge, after a year today, I now can play to score below 80 strokes for my 18-holes game. I have to praise your golf knowledge and teaching methodology. Your valuable key elements of golf swing I learnt remains the strongest part of my swing consistency and shotmaking accuracy. Will be seeing you again Master for more game enhancement lessons. Thanks to you for achieving my golf aspiration. A short note to thank you for designing the golf training program for my handicap test. I got my Handicap 19 on the first test attempt. You thought me enough technical and practical swing knowledge to prepare for test. Your method of teaching is very innovative. I also enjoyed learning all the challenging shots making on your golf course intensive training lessons. I look forward in the near future to see you again for my advance game improvement. Many thanks to you Philip for teaching me the golf swing. I enjoy and like your static and dynamics drills training for my golf swing development. Your one-on-one training was very intensive and tough but is worth my all effort. My profession tell me that you have had acquired vast knowledge, experiences, training and athlete learning behavious in the field golf coaching that make you great coach. You have me make proud of myself for been able to play confidently on the golf course after your 4 months golf swing training. care for your student more than I thought. Philip is super coach. I started with zero knowledge about golf and after his 3 months intensive and comprehensive training I played my first game gross score of 91. Philip will definitely be the golf coach for my recommendation. I like thank Philip for his golf swing coaching and on the course training. He is very happy with my first game gross score of 89 on an 18 holes. I like Philip motivation and the perfectionist training attitude. Philip is a very passionate coach. He is much more detail in teaching me the golf swing compared to my previous pro. Now I hit the ball straighter and farther. Thank to Philip. Just a short note for you to know how knowledgeable you are Philip Ang. I have to fly from Japan to see you for correcting my golf swing. Thank you for teaching me the in-depth technical knowledge of the golf swing bio-mechanic. I feel more confidence in hitting the ball to the target now. I like to thank Philip for helping me to get my perfect swing. I played golf for 5 years and taken lessons from 6 golf professionals. Philip is the only professional that teaches and explains the physiology of the body and the swing techniques in full details. He processes the attributes of a teaching professional I being look for (thank to my friend recommendation). The dynamics golf swing drills training he employed make my learning and mastering the swing fun and interesting. I now hit balls straighter and gained more distance despite at my age at 66. I also introduces my brother (age 70) to Philip and he is also very please with Philip’s methodology of teaching. Hi Philip, your methodology of teaching and in-depth knowledge of the golf swing merits this thank-you note. I learnt so much from your 10-Lessons golf swing training program. Now I can hit the ball more proficiently and confidently. My balls shot performance go straighter and farther. Philip exhibit far more technical and vocational teaching skills than the golf professional who taught me in Korea six month ago. You had made me mastering the golf swing much easier. Thank you again. I like to thank Philip for getting my golf swing and game at the right track. As a beginner I learnt so much from him that I am able break my 100 score after two months his training. I achieve the confidence to hit the ball solidly and now my games are more fun and exciting. I like his teaching methodology especially the instructions and therapeutic drills that help me to use the correct muscles to attain the body flexibility for the golf swing. In fact I can get my wife to start and hitting the ball by sharing the strong fundamentals and foundation of the golf swing I learnt from Philip. She is now able to play with me on the golf course. I did recommend a few friends to Philip and they are impress and benefit from his swing training programs. Hi Philip, On behalf of the 20 Soonye Kim Soon Club members I like to express my sincere thank for the excellent golf clinic coaching at Awana Golf Resorts. Your swing introduction and demonstration were really fantastic and inspirational. I have never seen anyone that can exhibit the golf swing like you and John did. You made it look so simple. The specialty shots shows were tremendous. The two days lessons learned from you and John are more than what I had learned from the past years. Hope to meet you again and wish you all the best. I feel very proud and confidence to swing and hit balls now after Philip one-to-one personal coaching. I started 6 months ago with friends at the range, but I am going to no where to hit balls consistently with all the donated and free lessons from friends. I practice as often as I can but to no avail. What I like about Philip teaching techniques and impress with his knowledge of the swing movement is that he taught me a club is just an extension of the hands, I need the move the body correctly during the swing and the club will swing along the correct path to hit the balls—it like the balls in the way of the swing path rather than manipulating the body and the club to hit balls. I wish that I had started the golf swing with Philip 6 months ago -I felt I wasted 6 months of time and money…..
Lastly, I like to thank him and his fellow teaching professionals for the fun and impressive corporate golf clinic at the range they conducted that compel me to sign up lessons to learn the swing to the correctly. Thank to your professionals service. I like to thank Philip for his personal attention to teach me the golf swing in just 6-lessons. The therapeutic drills and instructions he employed (making many repetitive swing movement) during the training lessons made my learning of the swing much easier. In fact I preferred his indoor training method to outdoor on the range which I had lessons with other pro. I get to hit more balls indoor to master the swing. I gain much more practical swing knowledge from Philip as compared to my previous lessons with other teaching instructors. I also have fun during the lessons. Thank again. Many thank to Philip’s intensive lessons for helping me to improve my golf shot performances. The most valuable part of the training lessons was how to use and feel the body muscles correctly during the swing execution which I had no ideal despite playing golf for the last 2 years. Philip is an extra-ordinary trainer who teach me how hit balls with eyes closed and also able to feel my swing sensation and movement when I hit the ball solidly. His lessons on the course on uneven ball lie situations with repeat demonstrations was so simple to hit and airborne the ball and yet compounded to the fundamental of the swing execution I learnt. Now that I hit my shots 10 to 20 meters farther and feel better. I cut off 7 strokes in 3 months and feel more inspire to play better golf. 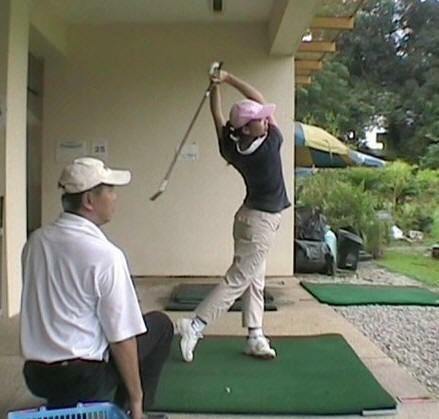 I am writing this letter in appreciation to Mr. Philip Ang of Asian Golf Centre for the improvement in my golf swing. 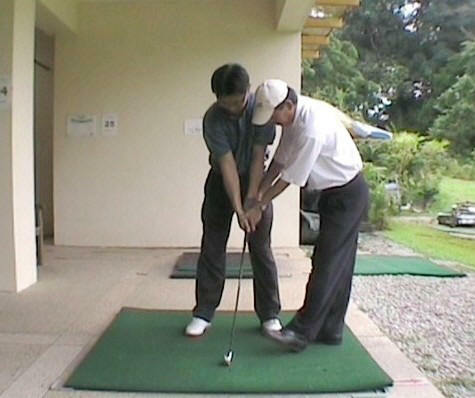 I had learnt under a teaching pro for 6 lessons for the golf swing. After the 6 lessons and many frustrated practice hours, I worn out a back muscle very badly. Even after all these, I could not even hit the golf ball without topping it. Upon meeting Philip and his assessment of my golf swing, he explained the problems I had and the reasons for these problems and injuries. With his explanation, I was certain that Philip knows what he is teaching and I decided to sign up for the Foundation Program. Philip was very detailed and dedicated in his teaching and employed various equipment to aid the lessons. Philip’s instructions and explanations of the muscle actions and body movements in a golf swing were also simple to understand. Apart from the use of video recordings, I like the use of the mirrors best. With the mirrors, I could see my golf swing being reflected as Philip explains the arms and body movements. It is reassuring to know that I learnt under Philip who demonstrated sound knowledge and understanding of the physiology of the body, coupled with knowledge of sport medicine and injuries, and unsurpassed passion and patience in teaching the golf swing. Philip exhibits traits that my previous teaching pro did not possess. My golf swing has since improved tremendously, hitting the balls straighter and further. This is a document that would serve to express my satisfaction with Mr. Philip Ang of Asia Golf Centre, as a Golf Swing personal trainer. I contracted Mr. Philip Ang’s to be my personal golf trainer because I already had 10 lessons, that is one on one with a Golf Pro. After the 10 lessons I still felt inadequate with handling the Golf clubs, my hands were strained from many missed hits, my back aching from clubs that were forcing me to hold my posture in ways that’s not naturally comfortable. As I was very keen on the Game & having a strong competitive nature I was determined to get a good level of mastery of the Game (like ASAP). I put in hours & baskets after basket of practice balls, but found out that I have no reference on what works for me, & also how to correct & improve my golf swing. So I was practising on all my bad golf swing fundamentals. Upon meeting up with Mr. Philip Ang, he did a quick assessment of my golf swing & pointed out some very glaring mistake & also advise me on the potential injuries that I might inflict on my body if I don’t correct my posturing during my golf swing. 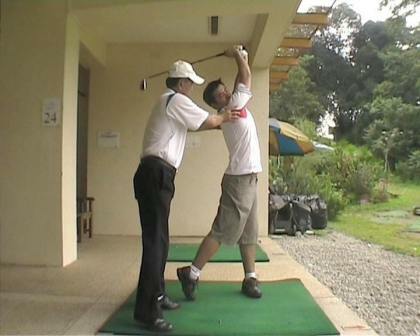 After 6 lessons with Mr. Philip Ang, I felt very comfortable & confident with my golf swing. Minus the injuries, aches & pains. I was also able to put in proper practice & do simple corrective exercises to improve on my golf swing. Now I am enjoying my golf game more, I am able to play with medium handicapper without feeling incompetent on the golf course. (I’m only a 9-month-old golfer). What works for me is Mr. Philip Ang’s commitment & passion for the golf game & the profession. Personal Note: We pay for our lessons in one form or other, I don’t have time to learn from my stupid mistakes (trials & errors) & injuries. So paying for proper lessons & enjoying the game is what I got from Mr. Philip Ang. I am writing this letter to express my sincere appreciation to Mr. Phillip Ang for the improvement of my golf game. I played golf for 5 years and scoring in the low 90’. Since December, Phillip had custom-fitted me with a new set of clubs and I signed up for the ‘Foundation Program’ of his golf lesson to enhance my swing. 1. To found out the cause and solution to my lower back muscle pain problems with proper posture set-up for the swing. 2. To my improved balance for more solid and consistent hit even on uneven ground. 3. To better understanding of physics of the body co-ordination when executing a swing. 4. In depth comprehension of the set-up, balance and bio-mechanic of the short, mid and long lever swing system. After the training program, the most important improvement that I acquired and achieve is the confidence in my swing each time I address my ball during my game. I have no more back pain and I improve my score by 8 to 12 strokes. Philip employs a very good and simple instructional, demonstration and analysis method (with video play back) throughout his lessons, which allow me to realize the difference of my swing before and after the therapeutic drills and exercises of the programs. I also have a chances see the lessons I even attended some lessons, which my friends had with other teaching pros., but was surprise how inefficient their lesson’s content was as compared to the three hours therapy I had with Philip.